Medicine used as an auxiliary in indigestion (bloating, eructation) after eating stodgy foods. Active ingredient of the medicine is complex liquid extract (0.5:1) from: oak bark (Quercus spp. ), birch bark (Salix spp. ), sage herb (Salviae officinalis L.), southernwood herb (Artemisia abrotanum L), thyme herb (Thymus spp. ), and common yarrow herb (Achillea millefolium L.) (2/2/2/2/1/1). 100 ml of the medicinal product contains 100 ml of the active ingredient. Ethanol content in the medicinal product is: 60-70% (V/V). Period of use: use when symptoms occur. 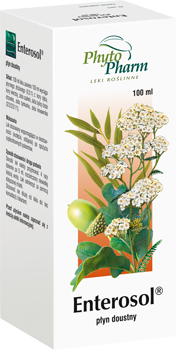 Traditional medicinal plant product with specific indications arising only from long-term use.